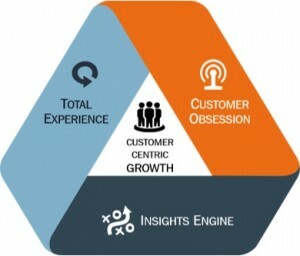 Total Experience, Customer Obsession and the Insights Engine. According to Insights2020 – Driving Customer-Centric Growth, the businesses which outperform competitors in terms of revenue growth have shown the highest level of customer-centricity (over-performers), while those with the lowest revenue growth show the lowest level of customer-centricity (under-performers). Insights2020 is the largest global study of its kind, involving 350+ in-depth qualitative interviews with senior marketing and insights leaders, and quantitative survey responses from over 10,000 practitioners in 60 markets. The initiative is led by Millward Brown Vermeer in partnership with ESOMAR, LinkedIn, Korn Ferry, Kantar, and the Advertising Research Foundation. Insights2020 builds on the Marketing2020 , a study that explored how global CMOs align marketing strategy, structure, and capability with business growth. The findings from Marketing2020 were also featured as the July 2014 cover story of the Harvard Business Review. The results of the first wave of Insights2020 research are conclusive: there is a positive correlation between customer centricity and revenue growth over-performance. So, what are the drivers of customer centricity and how do we achieve customer centricity? Insights2020 uncovered ten drivers of customer centricity which can be grouped within three key dimensions: Total Experience, Customer Obsession and the Insights Engine. The first dimension of customer centricity is total experience. Customers expect more than good products or services: they want a seamless and consistent brand experience that is built on a clear purpose for why the brand exists. Winning organizations understand this: 80% of over-performing companies are invested in ensuring that all activities are purpose-led, compared to only 32% of under-performers. Great brand purpose is based on a mix of inside-out factors (brand DNA, credibility, heritage, founder’s passion) and outside-in factors (customer needs, white spaces, societal shifts). As part of delivering a total experience, over-performers are more likely to use data-driven insights to customize their offer (73% vs. 31%). This can range from customizing the actual product to customizing service, pricing, distribution or other elements of the marketing mix. In addition to customizing offers and adding ‘depth’ to customer relationships, , over-performers are very much focused on delivering ‘breadth’ – using Insights & Analytics to create a consistent experience across all touch points (64% vs 29%). Driving customer obsession throughout the organization is the second dimension of customer centric growth. Taking the voice of the customer into account in every business decision is a key differentiator between over-performers and under-performers (87% vs 22%). This means that the customer centricity strategy must be embraced by all functions (79% vs 13%) of the company. Customer obsession should apply to all internal processes and decisions, as well as to all external partnerships and relationships. Over-performers tend to have much more strategic clarity because the customer centricity strategy is a priority for top leadership (91% vs 48%). Another way to embed customer obsession across the organization is to use a set of KPIs that drive the right behaviors. Over-performers base incentives on customer-related KPIs (45% vs 25%), motivating employees to bring customer centricity to life. Finally, culture and leadership are an essential part of this dimension. Culture at over-performing organizations is skewed more towards ‘embracing risk and experimentation.’ In addition, over-performers tend to have a much more collaborative cultural environment. The Insights2020 results show a third dimension of customer-centric growth: the mindsets, role and impact of the insights engine. Fifty-one percent of over-performers indicate that Insights & Analytics are leading their business. This is four-times greater than the scores from under-performing companies and indicates that in these firms, Insights & Analytics are influencing all parts of the business planning cycle. To do this, we see some important changes emerging from the past. Winning Insights & Analytics groups are evolving from the traditional support function role to one of a pro-active team player, providing scenario planning and recommendations, and ultimately being regarded by the rest of the business as a fully integrated business partner. The findings also highlight the differences between over- and under-performers in the instances of Insights & Analytics leaders that report directly into the CEO. For over-performing organizations this percentage is almost three times as high. Evolving to a world where Insights & Analytics take a leading role in the business requires a significant change in the critical capabilities of the people and the Insights & Analytics organization itself. The results of Insights2020 showed differences between over- and under-performers in terms of the Insights & Analytics profile: over-performers demonstrated more of a business context mindset, more of a whole-brain approach, and they are better story tellers than their under-performing counterparts. Having this business sense and preparation to have a leadership conversation is probably the most essential first step for Insights & Analytics to take on the path to a more leading role in the organization. The first wave of Insights2020 results has identified very clearly what solutions, cultures, structures and capabilities are more prominent at over-performing, customer-centric organizations. The ten drivers of customer-centric growth will be essential enablers of growth as the increasingly connected consumer allows us to understand their unique needs and behaviors in detail and traditional competitive advantages become commodities. Insights2020 proves that the brands and organizations that first adopt customer-centric strategies are reaping a competitive advantage and driving revenue growth faster than their competitors. To drive growth focus on the three dimensions: Deliver a Total Experience to your customers; build a Customer Obsessed organization; and create a powerful Insights Engine that allows you to harness all the possibilities the new Insights & Analytics has to offer your business.